Quest Apartment Hotels, one of Australasia’s largest and fastest growing apartment hotel operators, has marked the start of its UK expansion plans by announcing it has signed its first site in Liverpool’s city centre with a £10m investment. Paul Constantinou founded Quest nearly 30 years ago in Melbourne, Australia and has grown it into a chain of 160 apartment hotels offering a ‘home away from home’ for extended stay business travellers in key cities, regional towns and suburban locations across Australia, New Zealand and Fiji. The franchisor says it has 27 properties in the pipeline, with 12 under construction in its home markets; and is planning to open 10 properties across the country in the next five years. 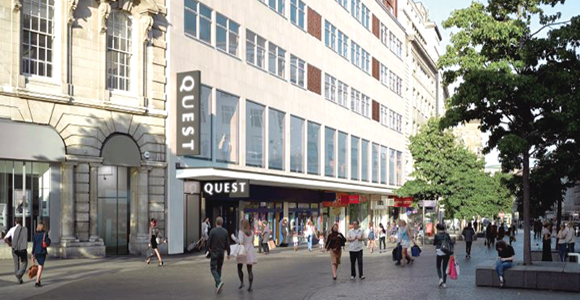 Quest Liverpool City Centre will open in 2019 and is located on Church Street along one of the city’s biggest retail streets and adjacent to the landmark Liverpool ONE shopping complex. The building for its first site is a 1980s commercial office with retail on the ground and first floors. Quest plans to convert the existing vacant office space on levels two, three and four; and construct two additional levels to create 100 serviced apartments with reception area, conference room, gym and back-of-house facilities. Andrew Weisz, director of UK development at Quest, said: “Hospitality brands have a huge role to play in opening up city centre locations for business again, but against a backdrop of economic uncertainty it is clear that businesses want to spend travel budgets wisely. Quest says it was encouraged by the government’s Northern Powerhouse strategy to choose Liverpool as the home of its first property outside Australasia. The UK Department for International Trade (DIT) has encouraged Australian business to expand into the UK. The British consul general and director general of the DIT, Australia and New Zealand, Michael Ward, commented: “We’re delighted to have been working with Quest on their UK expansion plans. A Quest Apartment Hotel attracts guests for short and long stays for both business and leisure. The flexible accommodation offers more space than a traditional hotel and includes separate areas for living, dining and sleeping.